Are you an American English speaker or a British English speaker? In case you had no idea, well this is a list of a few terms that differ between British and American English. 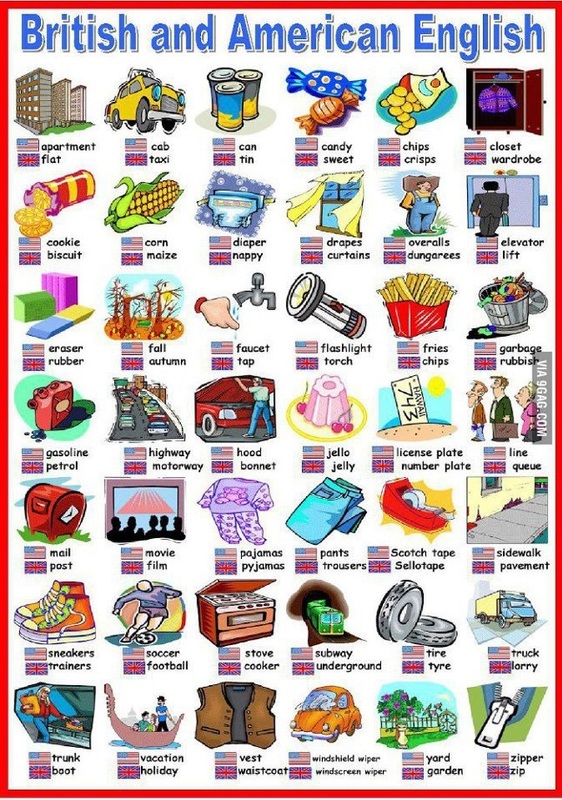 A few terms to differentiate between British and American English. Check the ones that you usually use and you will be able to identify whether your English has a British or an American influence. As far as I’m concerned, I used to use terms from both, up until I made an effort to focus solely on using American English just to avoid confusion. I would still use British English on very rare occasions; it depends on the person I am talking to. I ll share with the teachers! And what about Canadian English? Color or colour? Behavior or behaviour? Etc. Thank you for your comment, Jean. I believe “colour”, “behaviour” and other similar words are also used in British English. Anyway, this is how I found the graphic. I simply shared it with my readers 🙂 If I happen to find any other interesting examples, I will surely share them, too! Behaviour, centre, colour. However, we write tire, not tyre. “Canadian Tire Centre”. And I knew all those word pairs. Thank you, Rania, this is a good reference. And yes, many words that we (in the US) write with the “or” ending are written with “our” in British usage. A fun one that was missing from the graphic is “pants” in British usage; in American English that would be men’s undershorts. Also to “knock someone up” in the US means to get them pregnant; in British usage it means to knock on their door! There are also a couple in the graphic that may be confusing. US English speakers use both “curtains” and “drapes.” Floor-length curtains are called drapes, and ones that just cover the windows are curtains. “Autumn” is also used in the US, not just Britain, but “Fall” is a more informal term. what about the British expression ‘looking out of the window’ vs its US counterpart ‘looking out the window’? There are way more expressions and words. The graphic only shows a few. This is simply how I found it and shared it. You got the US – pants vs. UK – trousers, but missed the US – trousers vs. UK – pants.